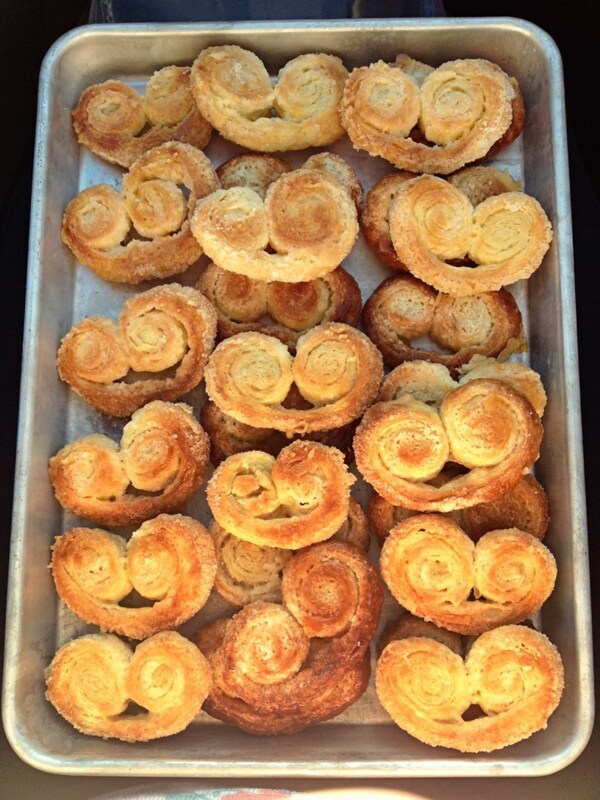 Matt suggested I make Palmier cookies for Palm Sunday to take into our church class this morning. I love word play and an excuse to make a cookie and I hadn’t tried making them before, so I figured I’d give it a shot! 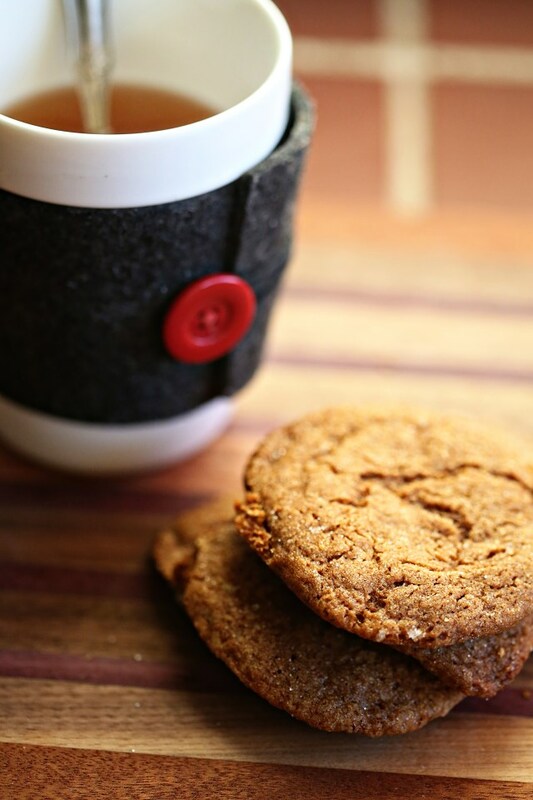 Turns out – it’s the easiest cookie to make, looks refined and tastes amazing with a cup of coffee! 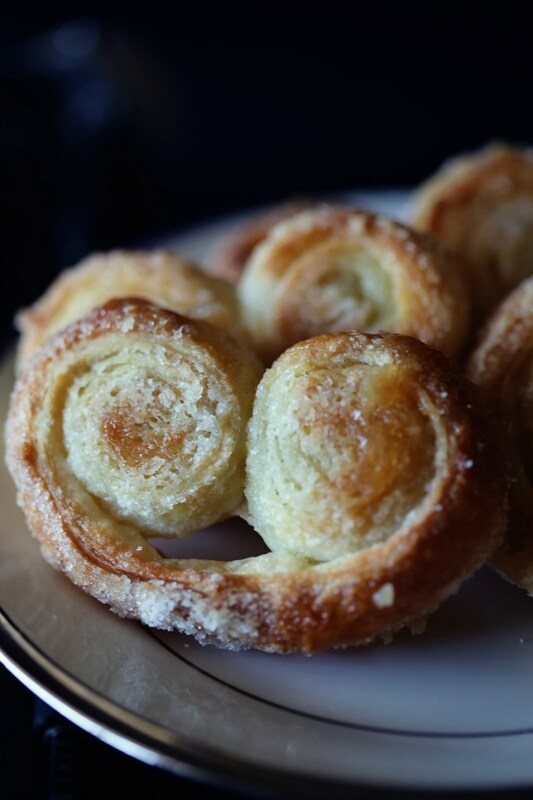 I’m a big fan of keeping a box or two of puff pastry in my freezer for various recipes, and now I have a new go-to cookie to make on the fly if someone is stopping by for coffee or just because! 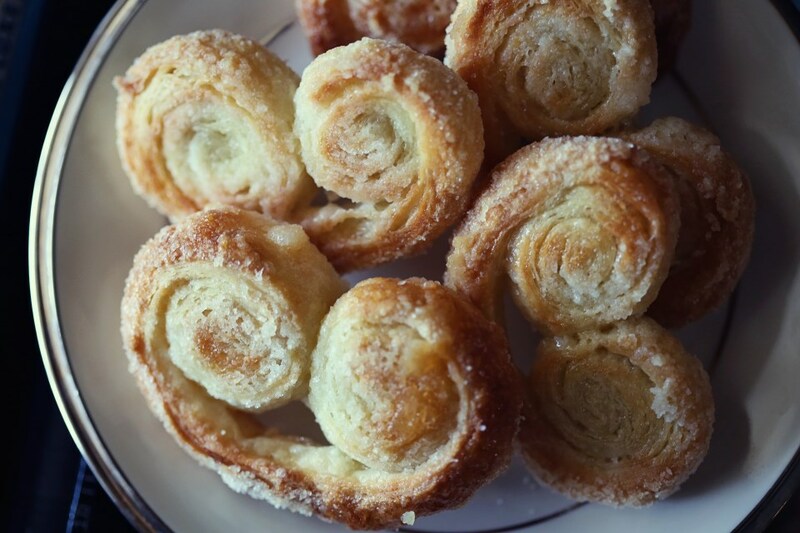 Spread a half cup of the sugar out on a clean surface evenly and lay both sheets of puff pastry out on top of the sugar. With a rolling pin, roll the sheets a bit flatter in each direction until about an 1/8th of an inch thick. In a bowl with the remaining sugar, add the almond extract and stir with a fork until blended and the sugar resembles wet sand. 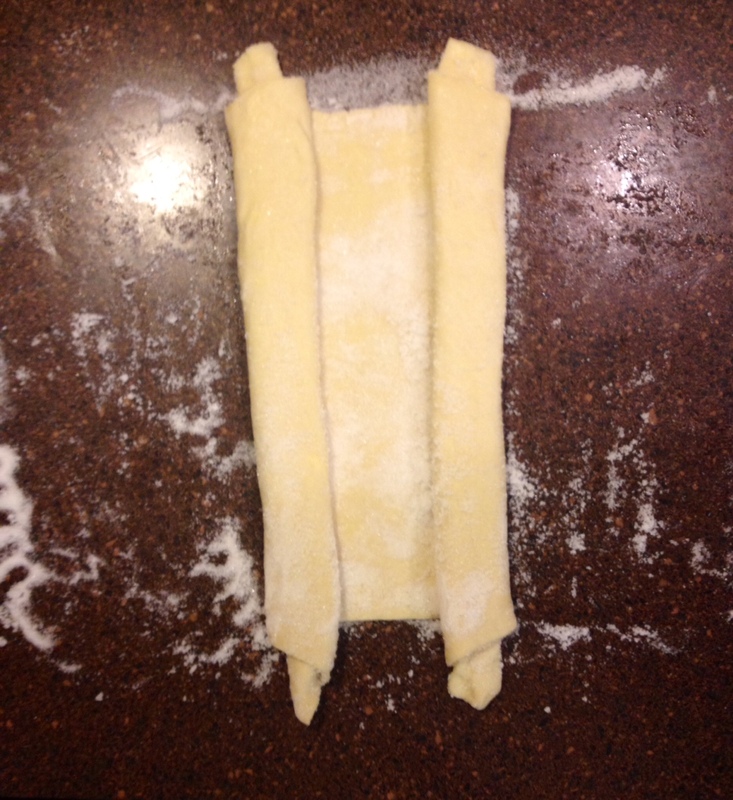 Spread the almond sugar over the surface of the puff pastry sheets. From each end, start rolling up the pastry as you would a cinnamon roll. It’s like rolling up a scroll! When both sides almost meet in the middle, lay one side on top of the other, like shutting a book. 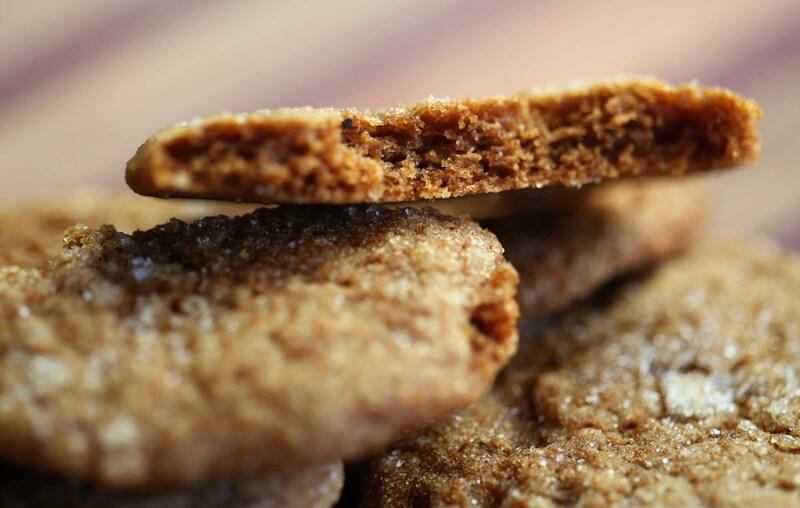 Press down slightly and lay on it’s side, cutting 1/4″ slices and placing the cookies on parchment lined baking sheets. 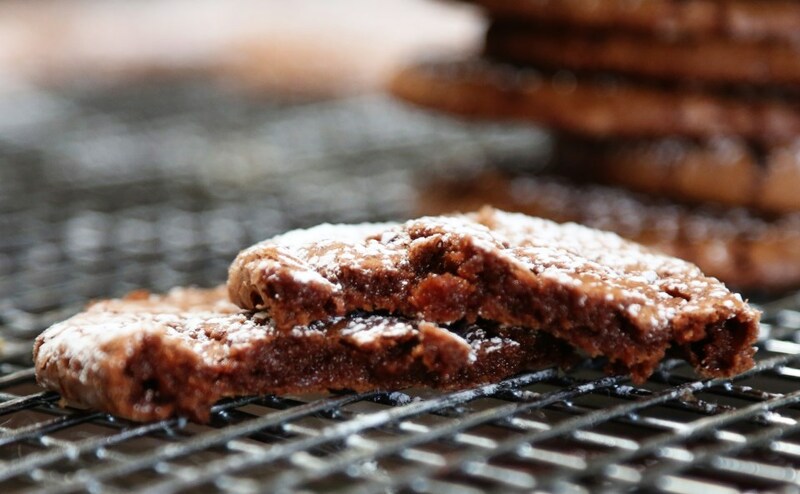 It’s important to line your baking sheets with something because the sugar needs to caramelize to make these cookies what they are and you may have a hard time getting them off the sheets unless they are lined. 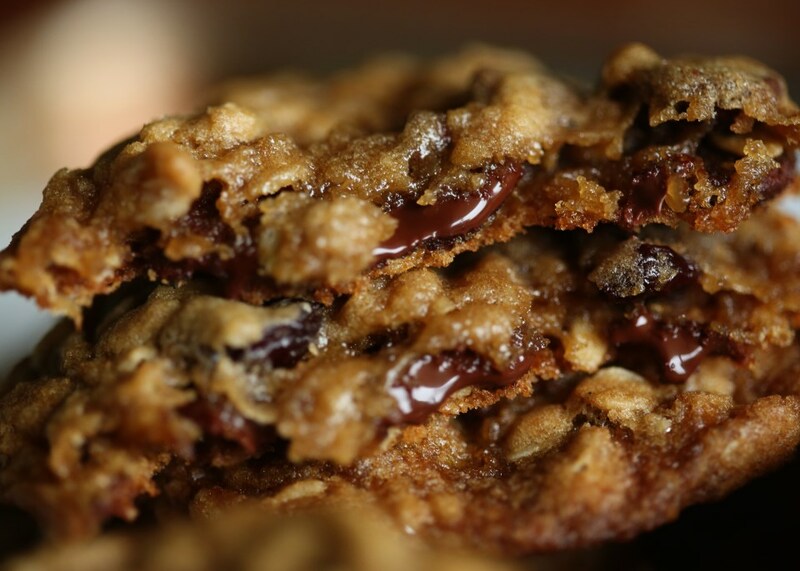 Bake cookies in a 450 degree oven for 6 minutes. 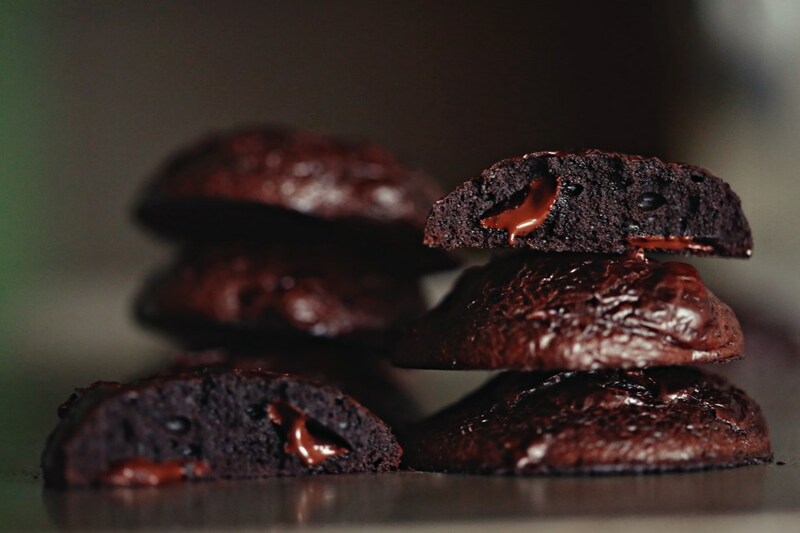 After 6 minutes, flip one and if it’s golden on the under side, flip them all and bake for another 5-6 minutes. If they aren’t browned, yet, leave them in the oven for another 2-3 minutes. You’re aiming for a good, golden caramelization on each side and each oven bakes different, so you may need to rotate your pans during the baking process. 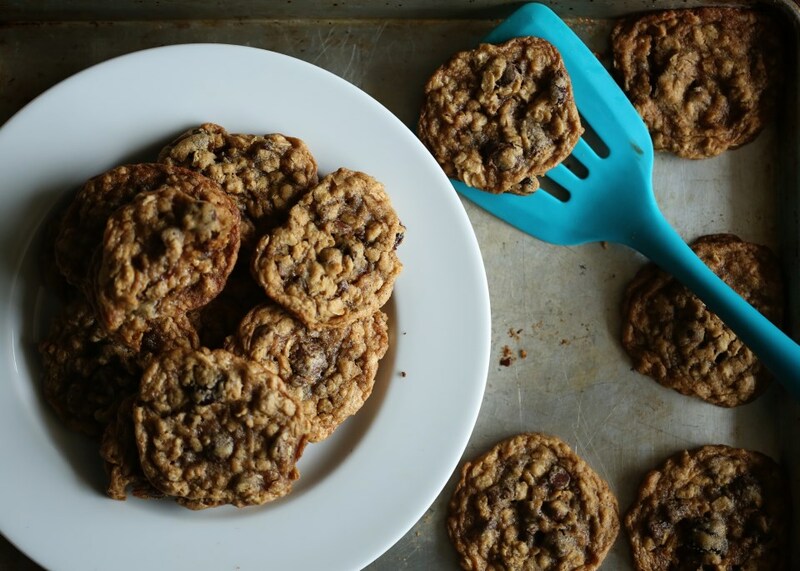 Let the cookies cool completely before serving. Have fun with the filling. 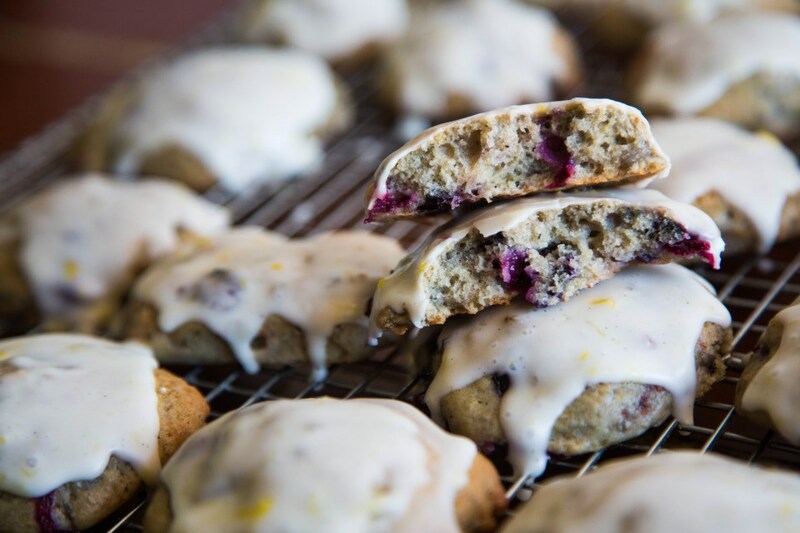 You could add lemon zest, orange zest, jam, vanilla – whatever you want to the sugar on the inside of the cookies. Have fun with it! I’ve been doing too much, lately. I got in over my head with a few embroidery projects because 1. I’m still new to the craft, but 2. I enjoy it so much that, 3. I think I am better than I really am, so 4. It takes me much longer to complete a project in real life than it does in my head. I also feel that with a baby in the mix and a couple precious hours in the day to get things done, that I should have scaled back. 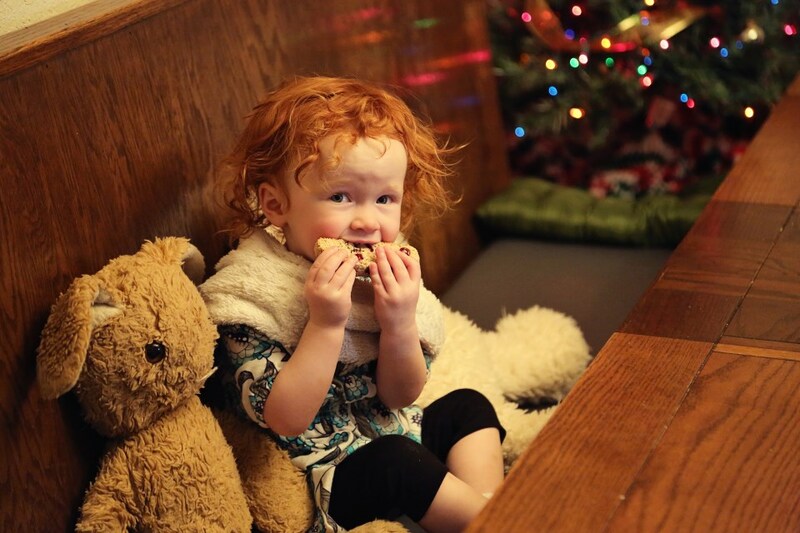 Baked less, bought fewer presents, gotten take-out a little more often. But I felt compelled to keep the ship afloat and do everything I wanted to do, even if there was no time. Amidst this feeling of being on a slowly sinking ship, I still hauled my tail into the kitchen yesterday morning and got the dough for this biscotti mixed up. I don’t think I’ve ever made the same version of this recipe twice, but that stops this year. I’ve finally found a combination of recipes that works and that tastes good. I’ve tried everything you can imagine from a no-butter, all egg white recipe (sad) to a recipe that called for oil (weird) and switching between fresh cranberries or dried. I don’t know why I tried so many variants when I knew in my heart that cookies need and deserve to be made with butter. 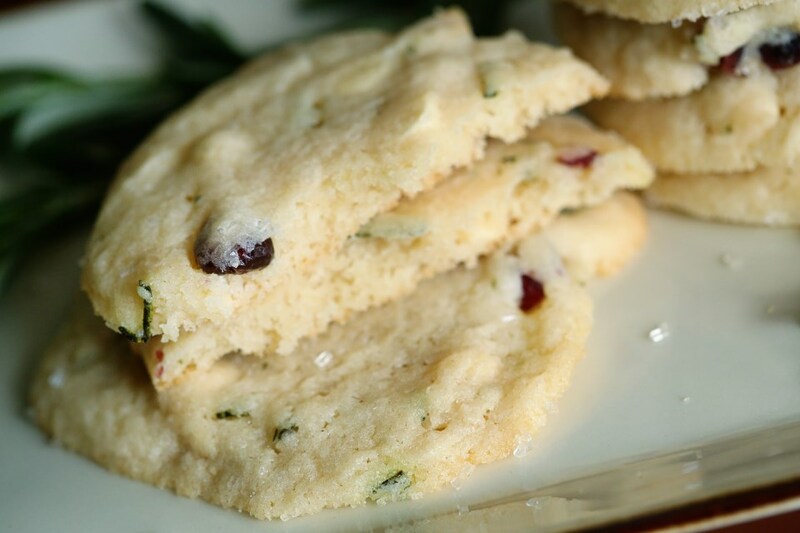 And after using dried cranberries every year, I tried fresh this year and I really love it. It distinguishes the cranberry from what could have been any ol’ dried fruit. 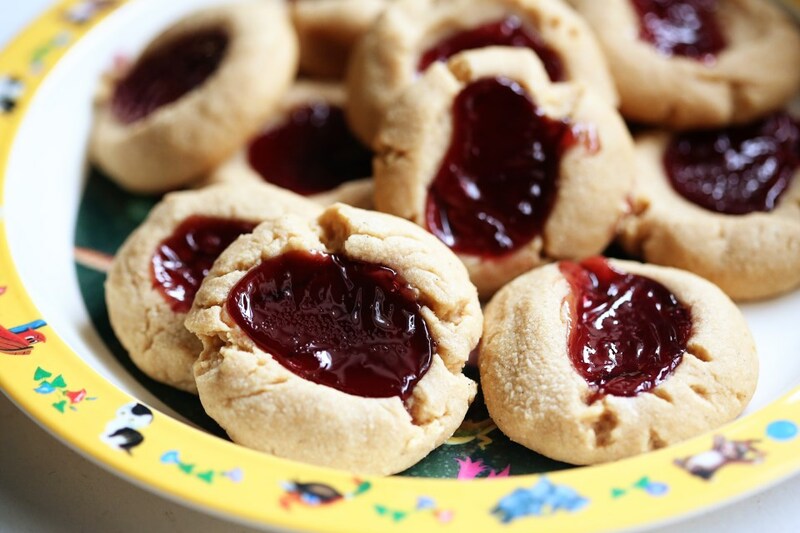 Fresh cranberries tint the dough slightly swirly pink and with the flecks of green rosemary, these cookies just make me feel the season that much more. Baking brings me closer to peace. Being in the kitchen is a calm that I don’t feel anywhere else. 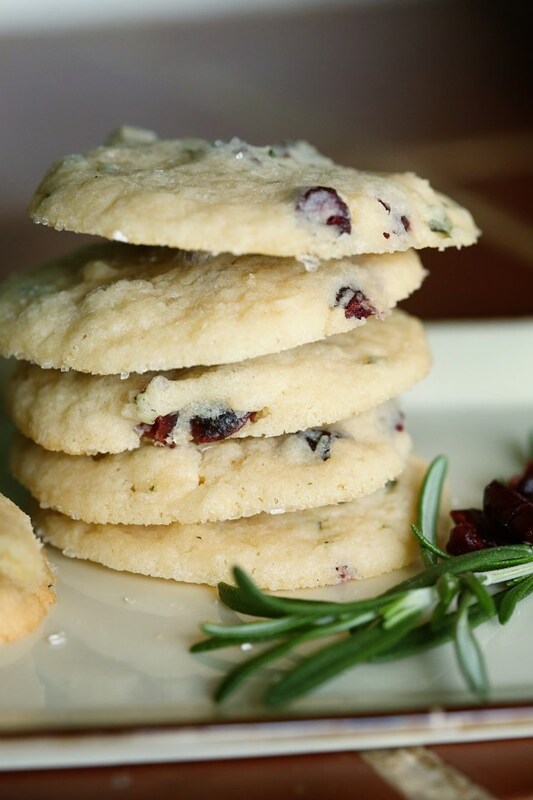 And so, even though Christmas seemed to come exactly 5.5 seconds after Thanksgiving this year, I found a pocket of time to keep the tradition going and bake my holiday anchor, also known as: Cranberry Rosemary Bisotti. Preheat the oven to 350F. Line two baking sheets with parchment paper, or use a silpat. Whisk the flour and baking powder in a medium bowl. Using an electric mixer, beat the sugar, butter, lemon zest, and salt in a large bowl till fluffy. Beat in the eggs 1 at a time. Add the flour mixture and beat just until blended. 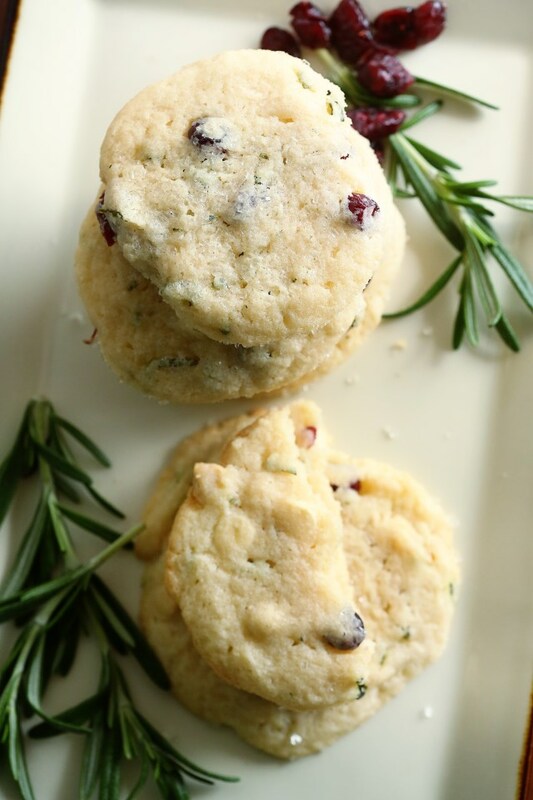 Stir in the rosemary and cranberries with a rubber spatula gently, until well incorporated. Form the dough into two logs, side by side on a baking sheet. Shape into long, flat strips, about 10″x 3″ by about 1/2″ high. Bake for 30 minutes until firm and then let cool about 20 minutes before cutting. Cut the logs into 1/2″ strips and arrange the slices on the baking sheets and bake for 30 minutes, flipping over once during baking. 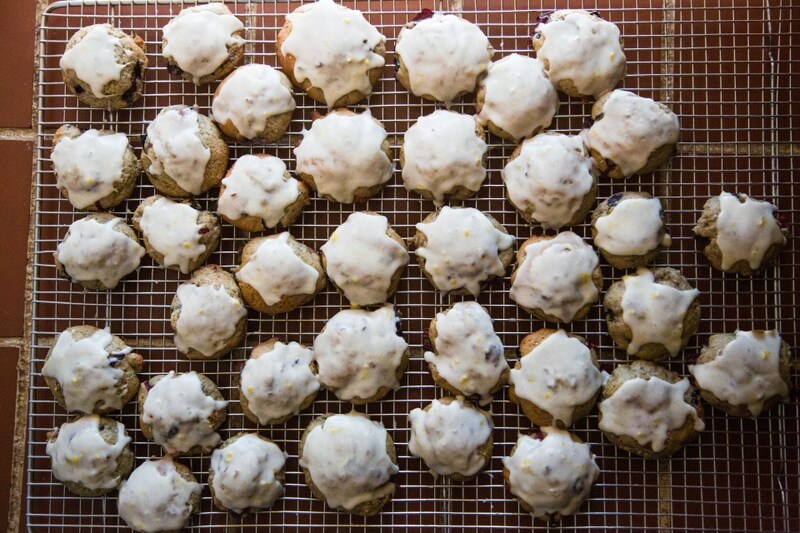 Let the cookies cool completely on a rack before drizzling with white chocolate. Melt the white chocolate chips in a microwave safe bowl at 30 second increments, stirring after each time, until just melted. 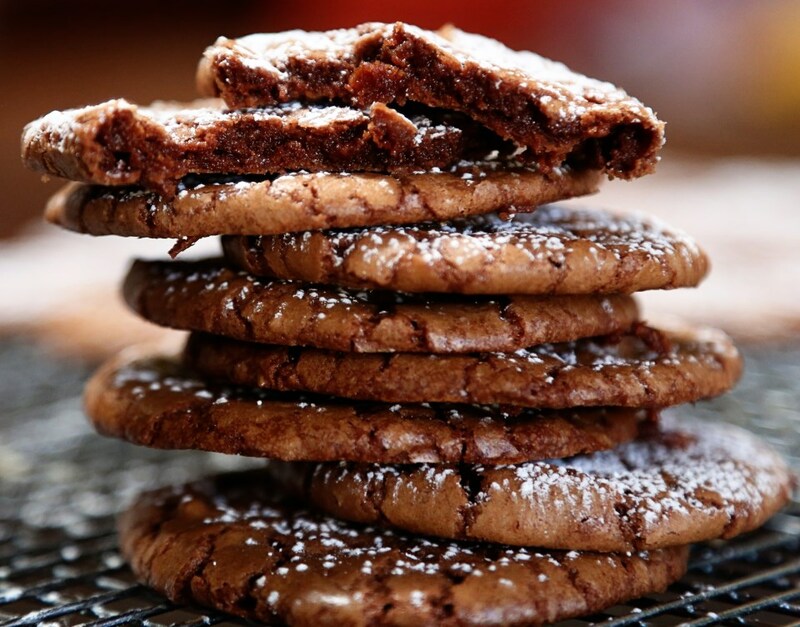 With a spatula, dunk into the chocolate and fling it around the kitchen with wild abandon. 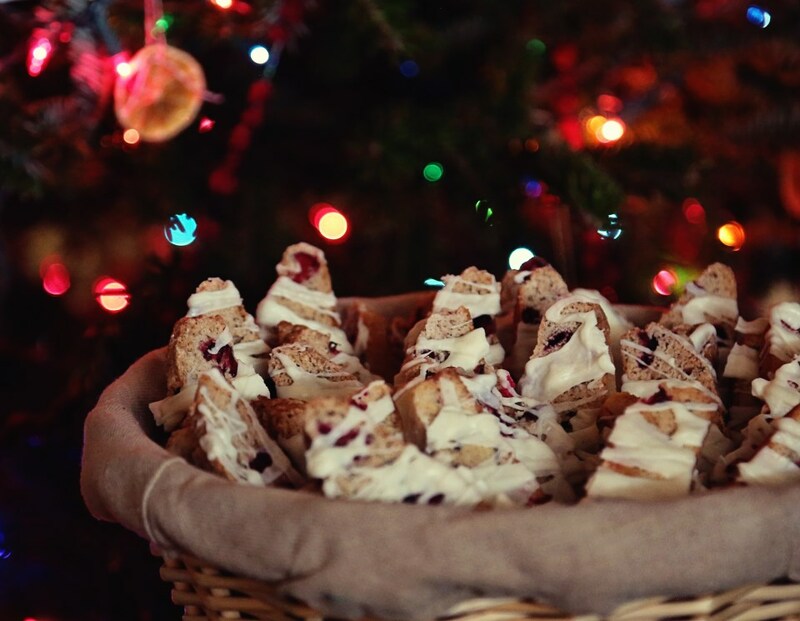 Or, just drizzle it over the biscotti until completely used up and everything is a huge mess. Let it dry before storing in an air tight container for about 2 weeks. 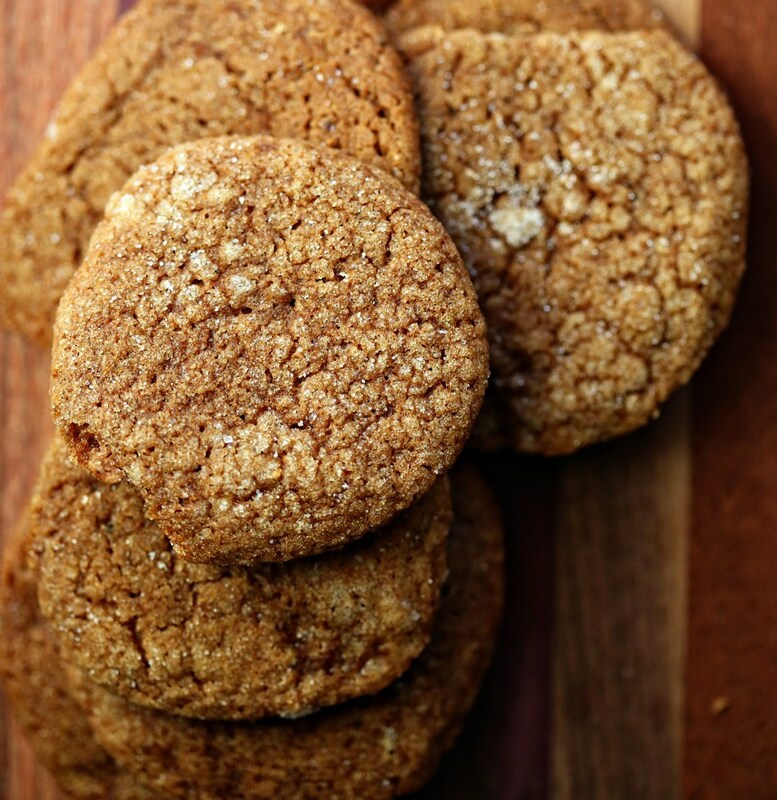 These cookies keep a while, so they’re great for gifts! I’m going to post about chocolate, again on Saturday, most likely. Because a friend from Matt’s old job just paid us $25 to bake him something for their company Christmas party. 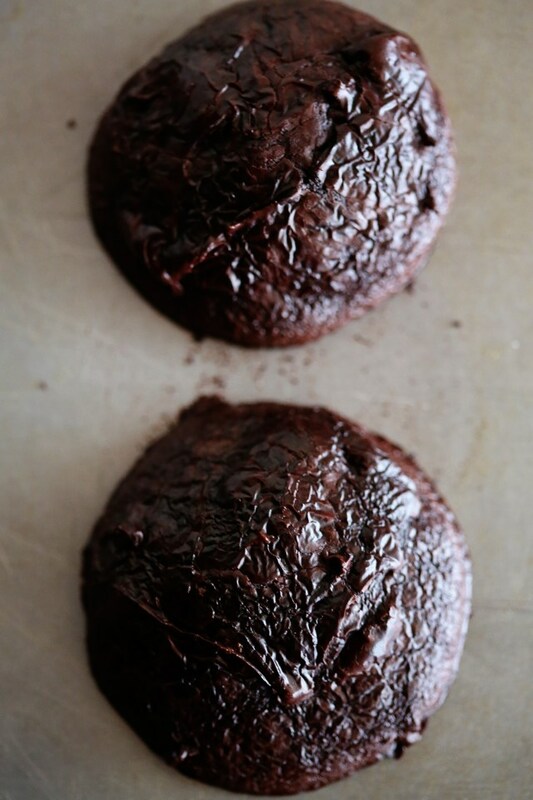 We thought it would be last Friday, so I made these flourless chocolate cookies. You can win any gift exchange or White Elephant situation with chocolate. Unfortunately (but fortunately) the party was cancelled due to ice and so I had to make a different chocolate indulgence today. It was hard, but I got through it. 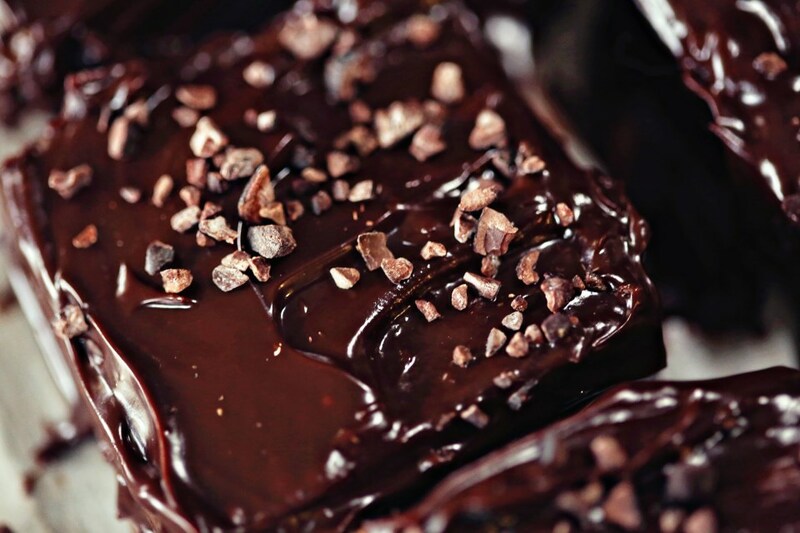 These cold days beckon rich, dark, warm chocolate. One of my favorite things in the cooking world is the moment when you’re stirring hot cream into chocolate chips and you think it’s never going to melt the chocolate, but then suddenly, a rich pool of blackness forms in the center of the bowl and in about ten more seconds, the whole bowl is transformed into ganache. This happened, today, as I was making the ganache to go on top of my little brownie creation (to be posted this weekend!) and I found myself grinning like an idiot. Transforming something good into something even better is one of the perks of working with chocolate. It never fails to please. 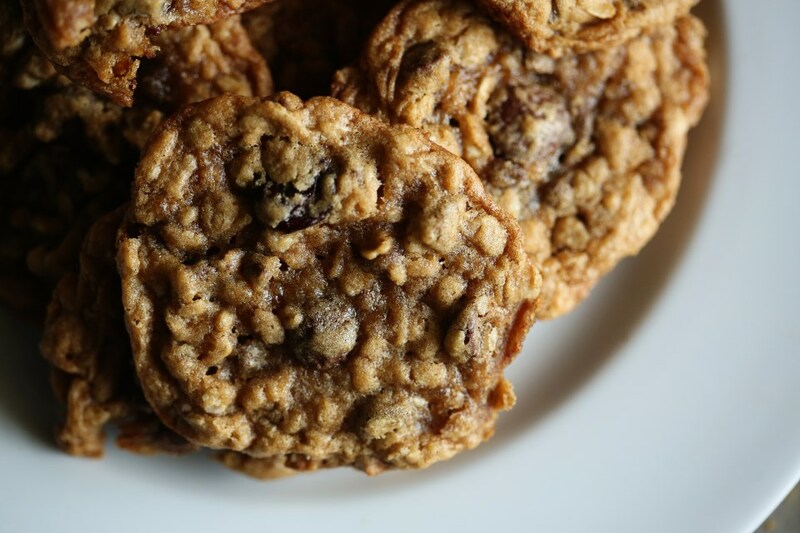 Like these little cookie gems! 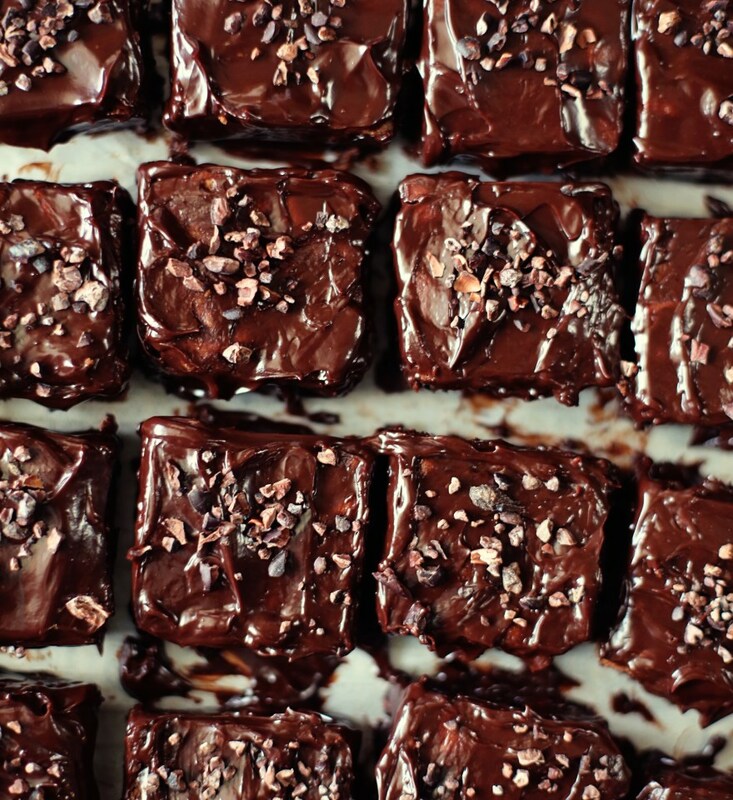 Flourless, fudgy, dense, chewy and melty bits of chocolate throughout. My one and only friend with celiac disease will be so happy 🙂 You’re welcome, Heather. 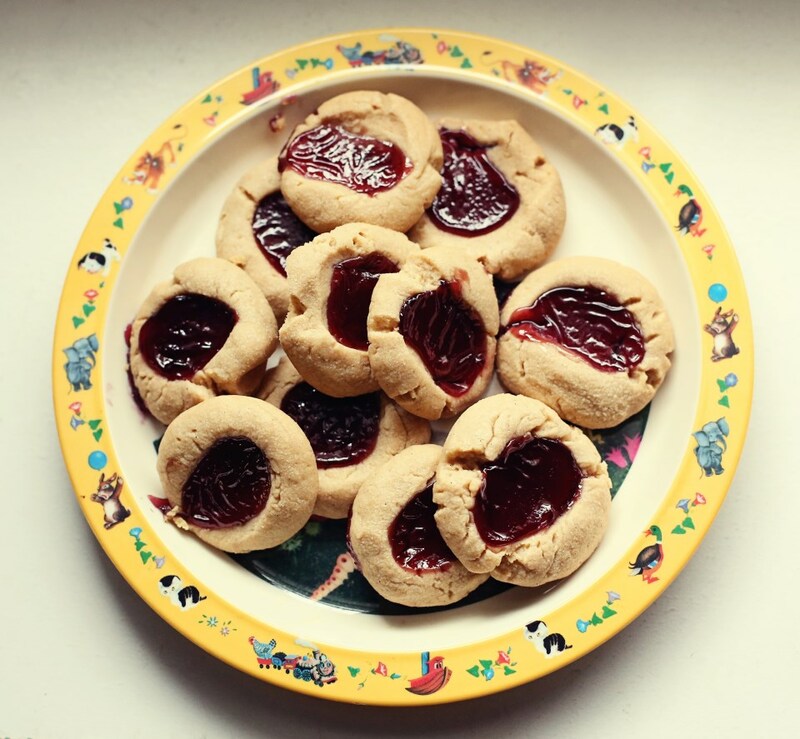 I can’t imagine a world without flour, but if I had to, these cookies would be repeat visitors to my kitchen, for sure. Preheat the oven to 350°F. Lightly grease two baking sheets. Stir together all of the ingredients till smooth. This is hard. The batter gets so gluey, you will be certain you have made a mistake. You haven’t. Just keep stirring. If I could do it over, again, I’d use a stand mixer. Scrape the bottom and sides of the bowl, and stir again till smooth. 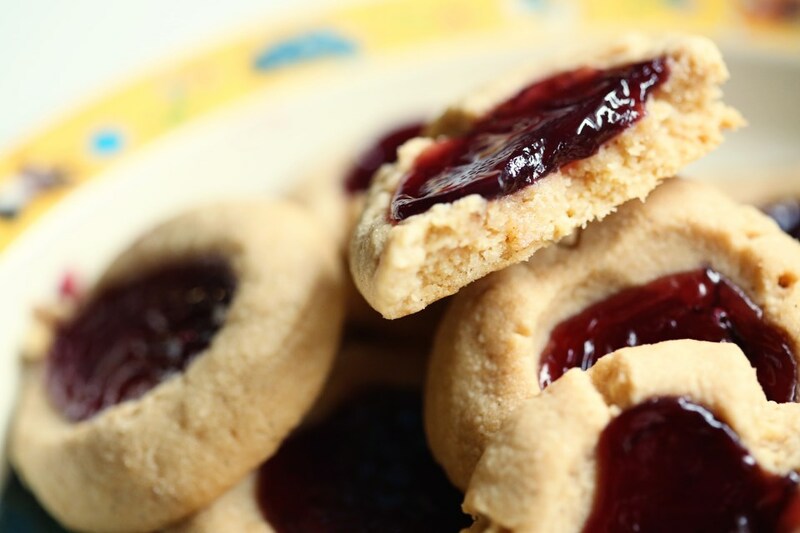 Drop the batter-like dough onto the prepared baking sheets by heaping tablespoons. Bake the cookies for 8 minutes; they should spread, although mine didn’t much, become somewhat shiny, and develop faintly crackly tops. 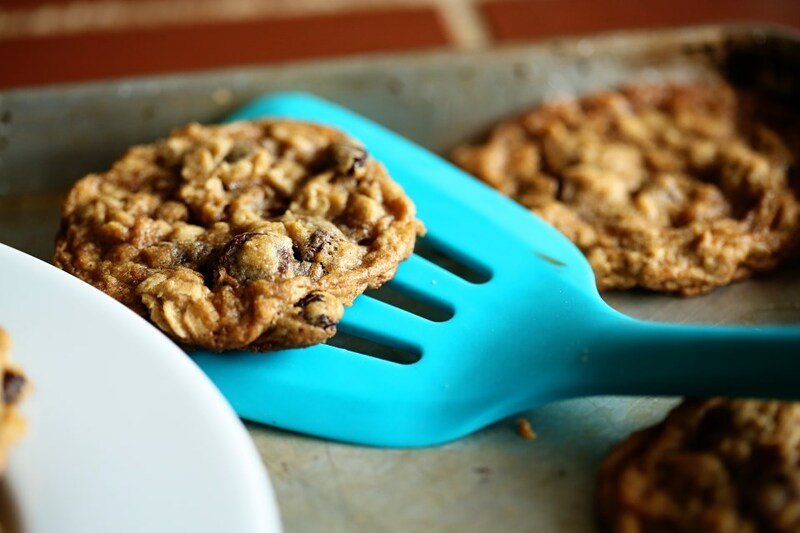 Remove the cookies from the oven, and allow them to cool on the pan.